A security deposit is the amount of money you take or give for the purpose of security of a property, service, premises, tools or rented item whatsoever. In any occasion of damage to the item or property etc, this deposit is not refunded back to you and rather the whole or part of it is retained by the owner. However in case no damage is done and the contract period is over, the person who gave the deposit will gate back the whole or previously decided amount and the receipt stay the eternal proof of this transaction of the give and take of this deposit amount. You can also see Doctors Receipt Templates. 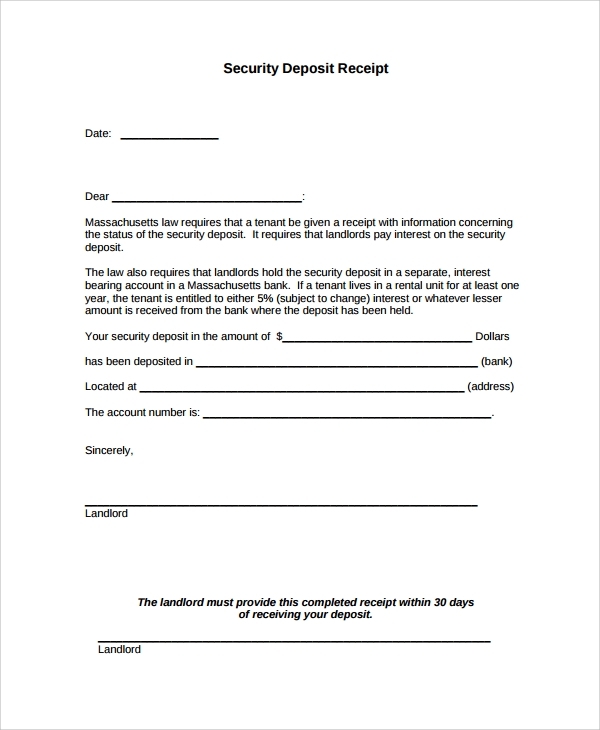 The rent security deposit is a very easy to use transparent form of a security deposit slip, which you can issue for renting your item to another party. 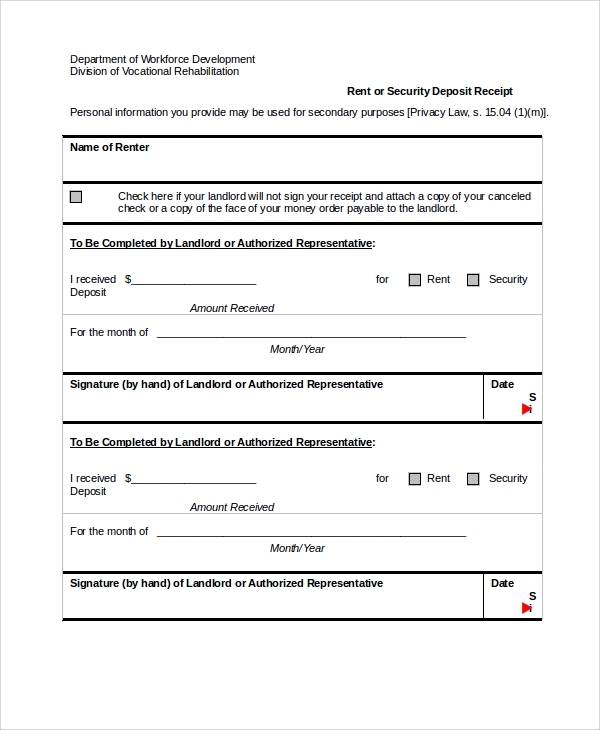 The deposit slip will mention the item rented, the amount of rent and the security deposit retained for this and the tenure of retaining the deposit. It will also mention if the deposit will be refunded after the tenure is over in whole or portion. 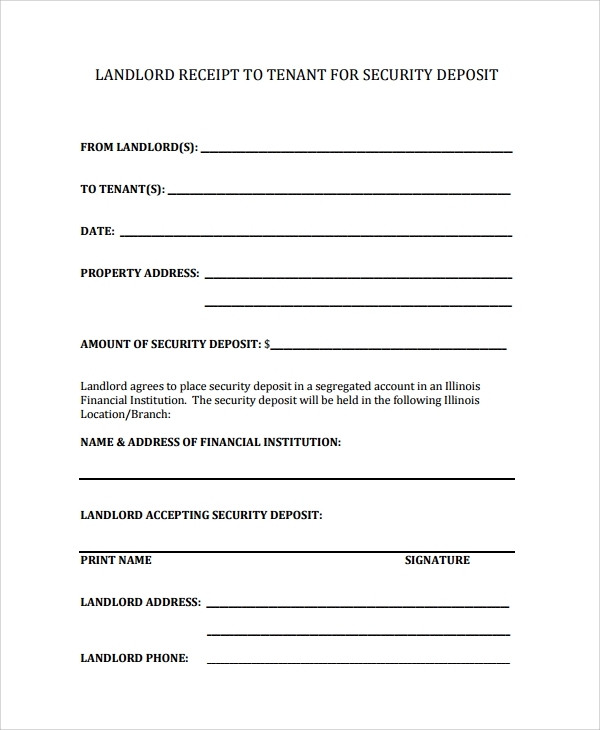 If you are renting your house or property for business or residential purpose to some tenant, you must issue a security deposit for this to the tenant. This format gives you the officially accepted style for making and presenting the deposit. The template is universally crafted and structured. That means you can make the use of this template to make and use as any security deposit in any purpose. Only a few tweaks and customizations will do the job for you. 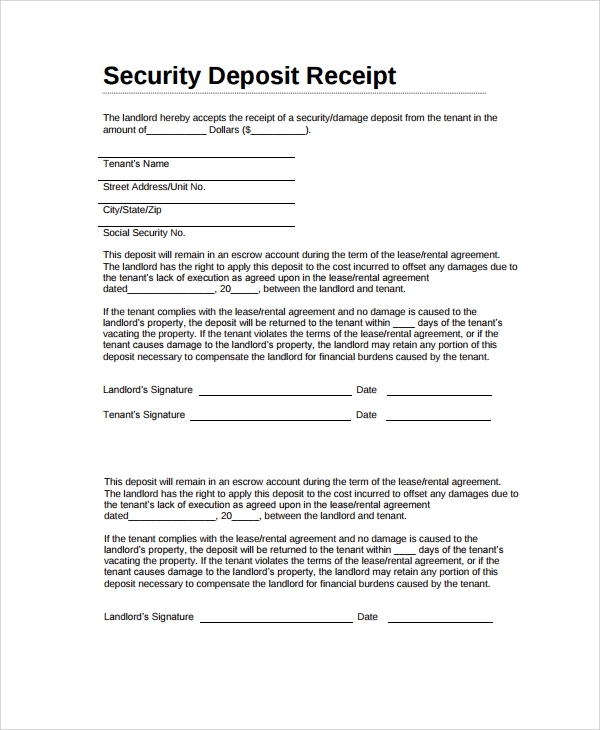 Why You Need the Security Deposit Receipt Template? 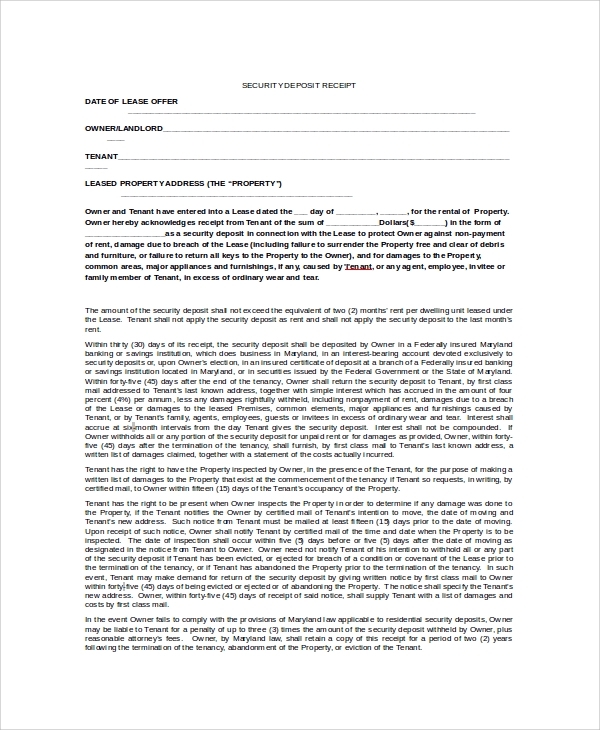 The security deposit form template is of high value as this helps you keep account of the money taken, the date etc, and is actually a proof of the transaction between the two parties. In case of any controversy either party can challenge another or sue with the support of this genuine proof. Since this is such an important document, on the basis of which the party making the deposit will again get back the money once the tenure is over, the designing of this slip is also important. Important field values, like the purpose of deposit date and time, cash or check etc, and the many other terms and rules has to be mentioned clearly on the receipt using both front and back sides of the file format. You can also see Sales Receipt Template. 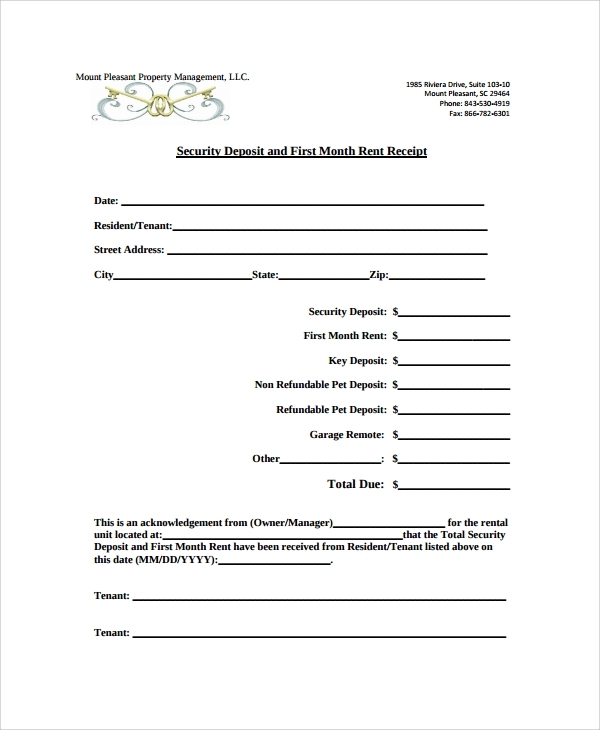 The importance of the depository receipts is huge in making a near perfect security deposit slip, which you may present anywhere to prove authenticity of the receipt. 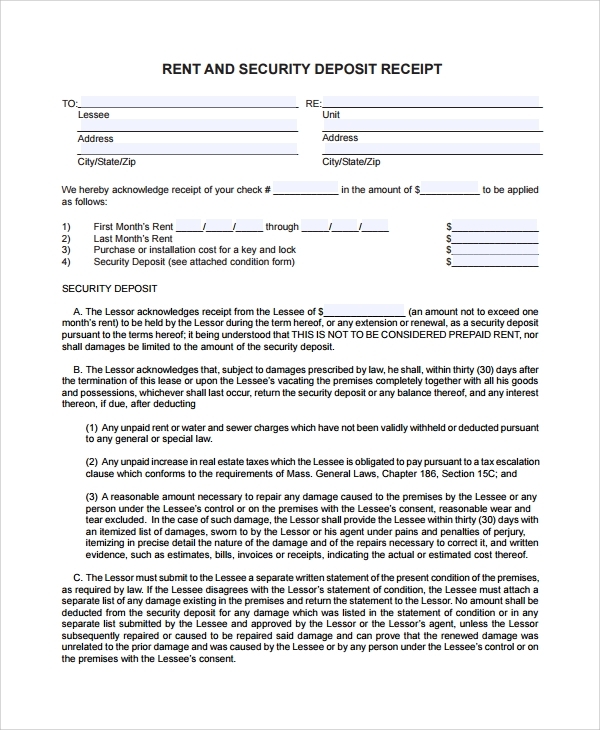 Moreover, a security deposit receipt must contain important mention of clauses and small rules about the retaining, usage and refund of the deposit. So that it all stays on a perfect structure and format on the paper you must get help of a template. The templates are made by experienced professionals for the use in any purpose where there is transaction of money in the form of a security deposit. Thus you get a lot of relief from making one yourself and get a ready to use a right format which is socially and legally acceptable. You can also see Invoice Receipt Templates. How to Use the Template File? Using the templates is really easy, and you may do this on your own. 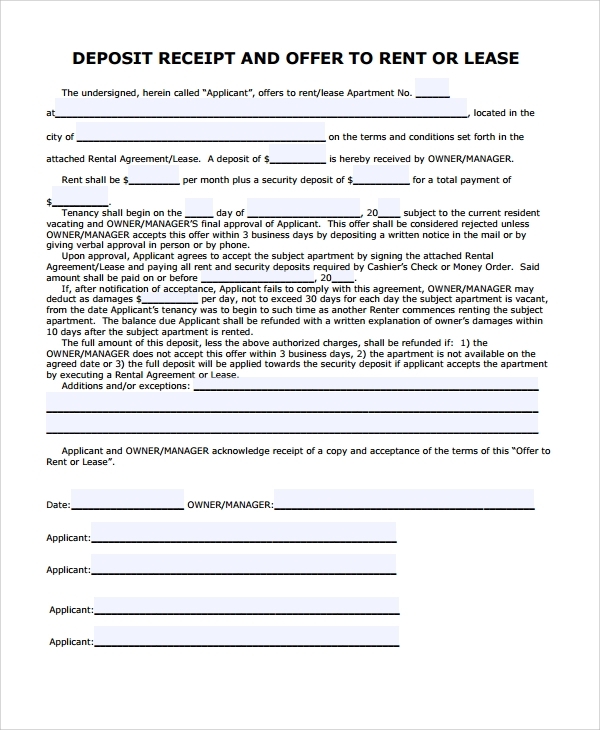 The templates have all the required fields which should be there in a standard security deposit form. You just need to select one style which suits your purpose. Then you can check all fields, and see if they are relevant. If you find any irrelevant field you can delete or change it. Since these files are PDF or DOC formats, editing and viewing and printing gets easy. You can edit a Word file easily, while view and print a PDF with ease. You can also see Fundraiser Receipt Templates. You know now that how you can make the best use of the security deposit receipt template, hence it’s no more a challenge for you. 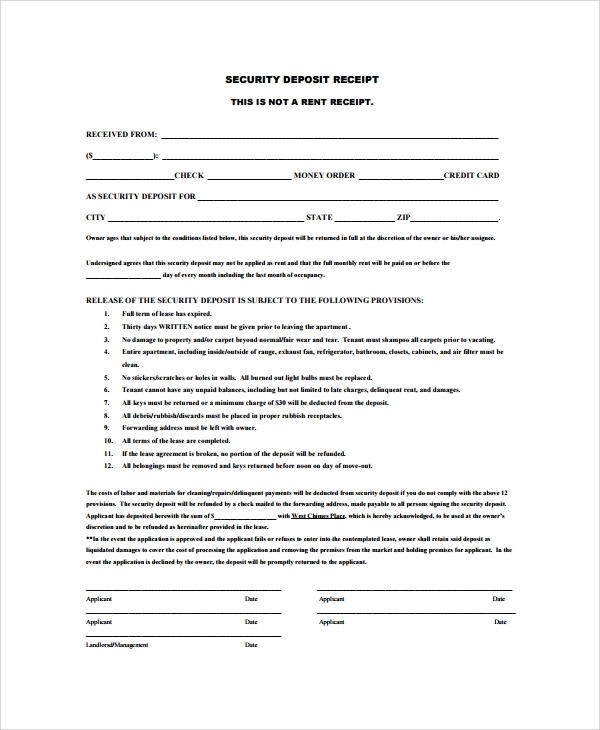 If you ever have to deal with security deposits, you can instantly refer online to get a receipt style apt for your needs, and get that printed.